The UAE is home to millions of expats who move in and out constantly. As often as someone arrives, someone else leaves. When it’s time to go home, finding a way to dispose of your used things is not always easy. Some people opt to ship everything back home. And others prefer to sell everything locally to recoup some cash for their move. There are a number of options for selling your things in the UAE. 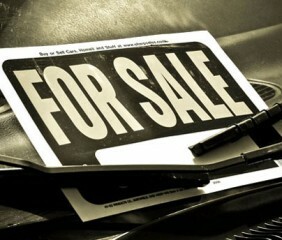 One way is to sell through web-based classifieds. However, these sites are actually quite cumbersome, because posting an item for sale is a long multi-step process. If you don’t mind this, you might mind the phone calls at one in the morning asking for your item at half the price listed. And most of the time, classifieds are for big things, like cars and homes; what about all the other stuff that you’ve accumulated over the year!? 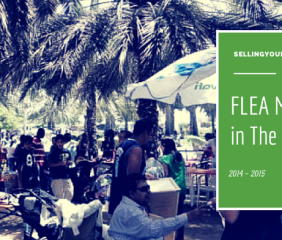 Another option for selling used items are the various flea markets and private sales that take place throughout the year in the UAE. These events are ideal when you have smaller things to sell, things that are easily transported from your home to the event site. However, due to the costs of booking a table at these events, it only makes sense to sell your stuff there if you have enough things to sell to cover your costs (factor in petrol prices and time). One way to reduce costs is to share a table with a friend! If you rented a table at one of these events, but you still have some stuff left over, post it on Melltoo for FREE and share your posts with friends, so they know what’s still available. After you post your stuff, we’ll handle the hassle of promotion, payment and delivery for you! All you have to do is snap a photo, sit back and we’ll deal with the rest! The charity flea market is a regular event at Sheraton Abu Dhabi Hotel & Resort – it takes place 3-4 times a year. Visitors can join us for a fun filled day to sell and buy pre-loved goods in aid of a great cause. Exhibitors sell unwanted items from their home (for example clothing, electronics, small furniture, kids’ toys), while bargain hunters can stroll through the market to look for the best opportunities. All funds collected from the exhibitors will support children living in poverty, while proceeds from the tables benefit the exhibitors. Do you want to declutter your life? 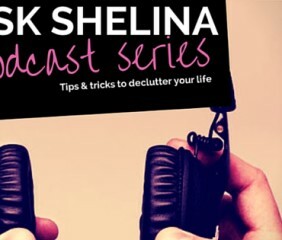 “Ask Shelina” is a podcast for anyone who wants to learn how to declutter their house, but doesn’t know where to start. It is hosted by Shelina Jokhiya, Founder of Decluttr Me, the first company in the UAE created to help people organize their lives and Melltoo Marketplace is the official organizer of the podcast series. Not sure what to do with all your excess stuff after decluttering? 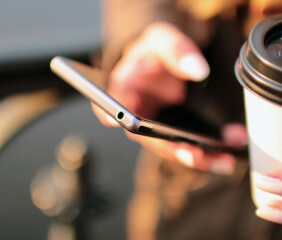 Melltoo Marketplace solves this problem by helping you promote your posts promote your posts and connecting you with buyers. We even handle payment and delivery on your behalf! Decluttering in the UAE has never been this easy. Hello again everyone and welcome to our fourth edition of the podcast brought to you by Melltoo and DeclutterMe. Again this week we have Shelina in the house to talk to us about decluttering. Shelina, say hi to us please. Shelina: Hi everybody, today I am going to talk about decluttering in the office. We are going to go through what I did recently decluttering a filing room and also an office in an industrial zone. Sean: Ok, So, I’m also going to ask a quick one since a common occurrence because offices are meant to be organized basically, so is it that we find then that it happens often – that we find the situation of cluttering in offices? Shelina: Yeah, and most offices are very disorganized. Companies have focussed on making sales and bringing in business to making profits and they don’t think about the back end. So they don’t think about filing or how to think about compliance and to regulation within the business. They don’t create systems for the business so people create their own filing systems individually, which can be a problem if they leave or if something happens to them or they’re are on holiday so nobody else can find the article or the document on the computer. Or on the server or on a piece of paper. So I go in to offices and educate on how to synchronize systems for everybody to use, so that anybody and everybody can find a document or an item immediately. So that’s is how I work now. Sean: Good, good. Because from our first podcast with you, the first week we did talk about you coming in from the corporate world. Having the experience from this aspect anyways from the start. So how has that helped you to do this? Shelina: Well, as I had said the first time we talked, I had been a lawyer and you have to do with a lot of paper as a lawyer, and have a lot of files. And I created new systems for filing rooms in all the companies I have worked in. Also as a compliance officer, so I understand regulations and how that we need to keep compliant in your office. So I use that knowledge to help decluttter and organize offices now in decluttering. Sean: That was lovely. So from the pictures we are seeing now, obviously this is one of the many offices you have done so far. Because we’ve been talking about homes and kitchen cabinets and storage spacers. This looks more informal and private. Now, this is, this is an office I would like to think is – people from different aspects, from different places in the world, different cultures. So how do you go about the process of decluttering an office space or an office area? What are the things you do? Just walk us through the process. Because from this picture has gone from flowers everywhere, and papers everywhere to just straight organizing like a book library. So just tell us what have you done? Shelina: What we had to do I had to work with and administrator and with the department for each area. For this area, we looked at the papers and looked at the files and saw which ones could be shredded, because they were so old. They were from the 1990’s so it could definitely be shredded. We also then looked at what documents could be archived, so that they could then be boxed away and stored in an archive facility. A lot of the boxes that you see there, they just had random pieces of paper. So employees had left the company, and instead of filing the documents properly or giving it to another employee, they’ve just dumped it in a box. So we had to go through all the paperwork and see whether it was needed or to be filed, shredded or archived. Thereafter, the files that were left were then sorted out into a system to make it easy for everybody to find it. The filing system before was based on the employee. So the employee had their own clients, their own filing system and different filing areas, which was just nonsensical. So everything was then put into a proper logical system for everybody to understand. And that’s how we work, and then I trained all the staff and explained to them how the system would work now. Some people don’t like it, but then they have to get used to it, because they work for they business, they don’t work for their own. So it has to be in a system that’s for the business. Sean: That’s good. The organization looks wonderful. So how do you do this, how do you go about this? What kind of things you put them through after you have organized the files and all that, I mean you have done your part. How do they carry on after you have left? Shelina: What I do is, I provide training; a seminar for all the employees, and all the relevant employees -all of them if I can. And we talk about the clean desk policy, which is something that I am a big advocate for. I don’t believe that it’s productive to work in a mess on a messy desk. So I explain to them about how to have a clean desk, what to keep and what not to keep. How to utilize technologies so that they reduce the amount of paper that they waste on their desk, and also how to have a clear work area. So, people keep files on the floor which is a health hazard, so if there’s a fire alarm, they could trip over the files. So I have to teach them, but they have to reduce how they are being non-compliant of health and safety regulations. There are now regulations in the UAE regarding this, which a lot of people are not aware of so I explain this to them and to employees so that it’s clear how they can work productively but in a safe environment as well. Sean: Ok, That is good. So, I have this question for you, on follow- ups. Does it normally happen that you get called back after a while by a client or say an office or a home, somewhere anyone. Do they normally call you back “Oh, uhm, something’s happened and It’s gone all bad again, help me.” What happens in this situation? Shelina: It can happen sometimes, some people find it very difficult to stay organized and that’s why they need help. I do provide continuity service for previous clients so that I can come check on them every few months to make sure everything’s fine. And then if they need me to do a whole session again, I will do that. But most of the time, it is just this continuity, I check for two hours or so, just to make sure that everything is organized, and give them tips on how to stay organized again. That’s sufficient for my clients. Sean: Thank you very much, It has been good really good to hear and very refreshing informative. I know, not just me, but our listeners out there, everyone that’s been listening for the past four weeks would like to know definitely what tips do you have for us?How do we go about leading very organized, no maybe not very but at least somewhat more organized lives. Could you just give us short little bit of tips? Shelina: My top tips are, if you have – go through once a week and get rid of one thing. So whether it is an old jar of marmalade that has expired, or an item of clothing. Just get rid of something once a week, and you will seeing a reduction in the amount of things that you have that you don’t need. Also, if you haven’t used something for six months, get rid of it. Unless it’s like a very expensive ball gown that you can only wear once a year. Don’t buy things unless you are sure you need it. So make a shopping list before you leave the house, so you do not buy three bags of sugar. So they’re my top tips. Sean: Thank you very much, I am sure that that has been really helpful for everyone, It’s been helpful for me anyways, I am privileged to hear all of that. I will start putting it into practice because I don’t like going on and on about getting things done, and I don’t get them done. But, we’ve been very happy to have you here, Shelina. Shelina: Thank you very much for having me. Sean: Yes, you are welcome, anytime. Well, we hope to have more sessions with you in the future because I am sure our listeners are happy to hear what you have to say at anytime. This has been really informative. It’s been really helpful what you have been telling us so far about getting organized because you’d be surprised what it does to someone to be organized. Yes, thank you very much. This podcast has been brought to you by DecluttrMe and Melltoo. Hopefully this has been very helpful to everyone as it has been to me. Thank you Shelina for coming and have a nice day everyone. 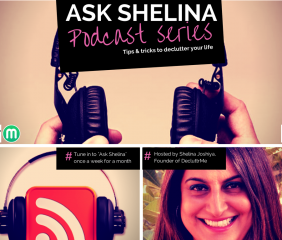 Here is the podcast #3 of “Ask Shelina” podcast series. Sean: Hi again everyone, it is Sean here with Shelina with a podcast brought to you by DecluttrMe and Melltoo. This week, we are going to be talking about organizing storage room. Because part of the work we have seen Shelina do with decluttering was a very, very impressive one with the storage room we have seen. It was very disorganized in the before picture. And then whollah, it was a boutique for shopping really when you see the picture after. So just wanting Shelina to tell us about this, how did you do it? What did you think of? What came to your mind? What was the inspiration behind this sort of organizing? Shelina: Hi Sean, nice to see you again. Shelina: Well, with this one, the client had a lot of things in there. A lot of shoes, sports gear, DIY things, and then the kids school bags and shoes. So looking at it, it looked terrible, but actually it wasn’t. You just had to go through all the items and decide what to keep and what not to keep. I worked with the client and her husband as well. He had a lot of shoes so we had to decide what shoes to keep and not to keep. Also, sports gear, what sports gear they were using and what they weren’t. And then after that, once we’d decided what to keep, then I went in and organized everything into proper systems. So there was one level for the wife’s shoes, one level for the child’s shoes and one level for the husband’s shoes. And then at the top, we used a basket which I’d bought from a new Swedish shop called Class Olson (2:06?) to put all the DIY stuff in it. And then we had the sports gear, so skipping ropes and all those foam things you use for your back, boxing gloves, golf clubs, they were all put in one section as well. So that’s generally how we organized everything in this one, yep. Sean: Ok, yeah – I just observed in the pictures of this that you have used this basket. It was used for the medicine cabinet that we talked about last week, and you have used it again here in this picture in this situation. I would like to think that it is one of your tools I would say for organizing, so can you tell us more about the sort of tools you use. The things you used for this organizing and where and how you get them and how do you choose to select what to use. Shelina: With most clients, first of all I see what they have already. Because we are all about decluttering and organizing so we’re not wanting to waste money buying more things unless we have to. So I track and see what they have and then after that, I will go into storage places. There’s Ikea, which is my favorite shop in the world, and I buy a lot of my stuff there. They have a lot of boxes especially a range called Soma (3:37?) in different sizes, which are perfect for most houses. Class Olsen is a new one, it has nice stuff as well, that I purchase for my clients. And then there is Daiso, which is brilliant for little storage boxes, storage jars. And I go to various other places as well and buy the items that are needed. And I can just tell from my experience what items to buy for clients. We do a consultation beforehand to see what is needed, what they already have. Sean: Alright, ok, that’s brilliant. Good, and this a personal one now, I just have to admit, I can get really, really messy sometimes with things at home and then I just stop to – I think I want to do it. I mean, I think I want to get them organized – but I just start procrastinating. I say, “I want to do it today.” And then maybe the football match comes on and then I’m, “Ok fine, I will do it tomorrow.” Something, always comes up, I never will get to doing it. How do you let me say, cure that? How do you get over procrastination and just do it? Shelina: You have to push yourself. If you can’t push yourself, you have to get someone to push you, which is where I come in. So most clients they’ve got to a point, say with this storage room. It got to a point where they couldn’t access their shoes, they could not access things because it was packed full of things. They could not walk into it,so they just had enough – and that was when they called me because they couldn’t take it anymore. And that’s what happens with most people. They get to that point where they think I can’t take it. So, with most people, it is when they realize that they cannot access things, they can’t find things. It takes them twenty minutes to find their car keys in the morning, that’s when they need a professional organizer like me to come in and help them to find everything, to organize stuff so that they do not have this problem again. Because being disorganized means you waste money, you waste time and it affects your health after a while so I help them to alleviate all those problems. Sean: Okay, well that’s been really helpful. I mean, I should give you a call these days. Sean: Thank you very much. Ok, one more thing, I mean from a question we got from one of our past podcasts from a question we got from the listeners – what do with things that you have – say for instance, you figure this person does not need something from their closet anymore. What do you do with things that are not wanted anymore? Shelina: With clients when we declutter, say with this one, they had shoes a lot of shoes that that we had to – that they decided they didn’t need anymore. So we either – if they’re damaged, we throw them away. If they are kind of soiled, but they could be worn again, we donate it. 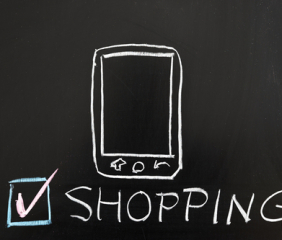 Then we also use companies or shops or apps like Melltoo to sell the shoes online. So there’s various different ways. I mean, you can try and make money out of it. So I encourage my clients that they can get cash out of the things they declutter using Melltoo or going to a flea market, or using some other company. Then they could do that. If they want to donate they can donate, but the choice is theirs. Sean: Ok, so basically you are helping people organized and make money at the same time, which is brilliant. I shall definitely be calling you. Ok, alright, with that we have come to the end of our podcast for this week. Thank you very much Shelina for coming again today. We appreciate your time. Shelina: Thank you for having me, it’s been great. Sean: Thank you very much. Until next week, hope you have enjoyed today’s podcast. Here is the podcast #2 of “Ask Shelina” podcast series. Sean: Hello everyone, welcome again to the podcast brought to you by Melltoo and DecluttrMe. This week we are going to be talking about decluttering your kitchen, medicine cabinets and cupboards, whichever one you have I’m sure. We have here with us today again, Shelina this week. She was here with us last week, she told us about decluttering. She took us through the process. How they came about, things she has been doing, so far within the past year. And the acceptance level, everything she has been doing which has been great. But this week, we want her to take up a bit more into the process. We want to know Shelina. First of all say hi to the people, let them know you are here, thank you. Shelina: Hello Sean, How are you doing? Shelina: So yes, today, we are going to talk about a medicine cabinet, a cupboard that I decluttered a few weeks ago. This was for a client who had one child and a husband and they had lots of medicine. Different ones for the kids and for the adults, all of it was in a mess, which you can see in the picture that’s on the podcast page. And they couldn’t find things, they found old cough medicine – and they kept on buying new stuff. They wanted it all to be organized so that they could easily find everything whenever they needed it. So I came in and looked at everything, and worked with the client to get rid of whatever medicine or vitamins that they didn’t need first and then we organized everything. Sean: Alright, so when you got in and you saw that the whole place was a mess, what was the first thing that came to your mind? What was the first thought you had, like the first thing you could think of to do once you see a situation? Shelina: Well, first of all, straight away you talk to the client. So you find out are their – if they or their children have any daily medical conditions which will require then that they need the medicine, certain medicine to hand straight away. And then you also find out about how they live in their home day to day. Do they actually need the medicine to actually be upstairs in the – nearer to them in the bedroom, or is it fine in the kitchen? And you ask certain questions to get a grasp of the situation that they’re living in at the moment. And then you go, start going through all of the stuff in the cupboard and taking out and deciding what to keep and not to keep. So it’s a very personal interaction with clients to declutter and then to organize everything. Sean: Ok, so, ’cause in my mind, I am walking through the process as well. So, now we have talked to the client, we know the situation; we know we have gotten the necessary information. What do you do next? How do you know which way to organize? Which sort of technique or method are you going to use? How do you go about that? Shelina: For me it is intuitive, so as soon as I see items I know how to group them together. So for this client, they were coughing a lot, they had been having colds and flus quite often, so we put into one basket all the cough medicine that hadn’t expired. The Panadol, the aspirin, all those kind of cold flu medicines were all put into one basket and then labelled. I was trying to be funny so I called it cough, cough. And I try and make it a bit more exciting when I label the baskets and the boxes. So that was one basket, and then we worked on first aid box so the plasters, the antiseptic cream, the Dettol, all of that was put into another box and then labelled as the first aid box. And that should be accessible straight away, because you always need the first aid box in an emergency -something always happens. And then we created another box afterwards, which was for stomach and relief of indigestion and all. So you put that kind of thing. And also for relief, I put in all the bandages, the big bandages – when you go to the gym and you hurt yourself, because there was enough room in the basket for that. And another box that we had was a miscellaneous, with the extra medicines and different items. So everything that’s – the extra things that you can’t class straight away, you put it into this one basket. And it was at the top because it is not used very often. With the vitamins and the supplements that was put into a separate cupboard, because they wanted that with all the organic food so that was separated from the actual medicine. And so, that was how we organized it, and we had to make sure the items were put into a cupboard that was not reachable by the child. So it has to be high enough, because otherwise it can get dangerous – and so we put it on a high cupboard, and both parents were very tall, so they could reach everything, so that was good for them. And that’s generally how that was organized. Sean: That is good, I mean, it seems simple enough, but I do not think I could do that. Anyways, just out of curiosity, in a situation like this, you will have obviously some expired medicine. What do you do with those ones that are not needed any longer or that expired or out of date? What happens to them now? Shelina: The unfortunate thing here in Dubai or in the UAE is that you can’t go to the pharmacies and give back old medicine to destroy which is what you can do in Europe. It is a requirement that you can go to a pharmacy and give back whole medicine than to destroy. So here I recommend that if it’s say a cough medicine, it’s thrown in the sink, and then the bottle is thrown away. With tablets, if you can destroy them by crushing them, before you throw the packets away, if not throw it in a bag that can’t be accessible by the children. It’s dangerous, and hopefully it will change; the policy here, so that we can go to pharmacies and deposit unwanted medicine. But for now, you just have to throw it away in a safe manner. Sean: Ok, interesting. Alright, I guess this brings us to the end of today’s podcast. It has been very informative. Thank you very much Shelina. Next week we will have you again, talking to us more about decluttering and we will not just be talking about medicine cabinets this time around. You will be telling us more about the house generally – definitely different things. We look forward to having you next week. Thanks for coming here today, Shelina. Shelina: Thank you for having me. It has been great. Thank you.